On this week’s episode of TWiG, Leo, Jeff, and I were hoping aloud that there would be some way to merge existing Google/Apps accounts into one. It doesn’t look like that will be possible. 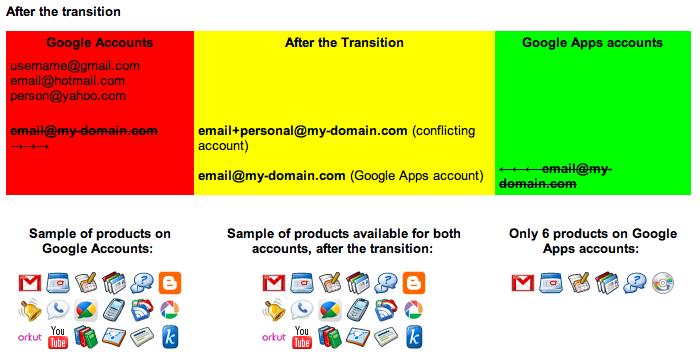 However, if you have a Google account that “conflicts” with your Apps account because you’ve assigned the same email address to both, GOOG will resolve the conflict by adding a +personal to your regular account’s sign-in address. Stay with me here. Here’s what that means. If you have a Google account for sue@example.com as well as a Google Apps account for sue@example.com, after the transition you’ll still be able to sign into your Google account using sue+personal@example.com. It’s a bit confusing, and a little more work than the one-click account merge we’d hoped for. However, thanks in large part to Google’s internal Data Liberation Front, many of Google’s tools offer data export features. So, while it’ll take some time, it shouldn’t be difficult to export your data from your Google account and import it into your Google Apps account after this transition is done. Update: Hooray!! You can currently request to port your Google Voice account to another Google account (though not a Google Apps account–yet?) Thanks, programzeta! I hope you will provide additional visual aids on the next TWIG because I don’t understand a word of that. I just want my apps account to have the same access as normal accounts, but I guess that’s not going to happen. Sounds great. Transitioning to a new Google account is very simple with there built in portability however I agree there needs to be pressure applied to make sure Google voice can be linked or ported over to the apps account. This is great news. Now my only question is when will Google fix its Google sync app for Blackberry? The problems have both existed for an exceedingly long time. Google Voice can not yet be transferred to Google Apps (yourdomain.com) accounts. But this will be amazing once it is possible to get it all transferred to a Google Apps account. I changed the e-mail address for my regular Google account to be different from my Google Apps account. What about if your company has a domain for apps (@example.com), but you also created a google account for your company (example@gmail.com) for YouTube, Blogger, etc. Will that be able to merge together? At this point, if I’m just about to set up accounts for a new website, would you guys recommend going ahead with a Google Apps account right now? Any news on whether Google apps premium will be allowed to buy more space, or will we still be limited to 1 gig? That’s the transition point baby. Google provides an interface to request the move of your Google Voice number from the user+personal@domain.com to user@domain.com after the transition. I’m highly confused. I have an apps account; it’s kevin@*******.com, omitting the domain so I don’t get spammed. I used that email address to sign up for a google account. Later, I also got a gmail account, *****************@gmail.com, associated with it. My apps account has a different password from my google account. When I sign into something like analytics with kevin+personal@*******.com, it doesn’t work with either password. If I sign in with kevin@*******.com, it only signs me in with my google account password. Am I misunderstanding something here? Guess what confused me is the notion of “same email” – I have two accounts with different email addresses. I’m curious how Google Profiles and associated URLs will be handled. I have my Google Profile setup with my preferred URL (google.com/profiles/kevinzolk) using my non-Apps Google Account. Post-merge, will I be able to associate my existing Google Profile with my “upgraded” Google Apps account while maintaining the same profile URL? I would think that since my URL is already taken by my existing Google Account, I won’t be able to use it with the upgrade Google Apps account unless Google does some work behind the scenes to make that happen. I was more excited last time you posted on this topic a few months back. Now I’m still waiting. I feel like it’s still a long way out and their approach doesn’t sound promising either. Never quite understood why the two were separate in the first place. I use vanilla gmail and I still use my domain email through it. For free no doubt. So not quite sure what Google’s plan was when they created the google for domains. If they wanted people to use their own domains through gmail and pay them for it why do they allow a very similar feature in vanilla gmail? Anyhow, huge fan of Gina’s and TWiG! Gina (or anyone I guess), how come I’ve read a million times that Google Voice is now open to the public yet I still cannot get access myself. Even Google’s page shows a message about how it’s currently not open. So why is it being reported to be open publicly? I think even you’ve stated this. -I take that back. I tried multiple times the first week the news was released and not since. I tried once more after posting this. It works and I now have my new number! Woo!! I have both a regular Google account with Google Voice and an apps account (sans Voice). After I saw this post I figured, what the hell, I’ll try and have my Google Voice account ported to my Apps account. I followed the link at the end of the post, requested that it be changed and sure enough, 24 hours later I can now access my Google Voice account with my Google Apps username/password. Feel free to hit me up if you’d like to verify. Google Checkout has not been ported to transfered Apps accounts, and GV accounts can only have credit added from the associated Google accountt. This means that there is now no way of adding credit to my GV account (which ran out of credit this morning!)!!! I have same concerns regarding voice as you…et us know what you learn when you learn it! There will also be no way of adding storage to your account on Google Apps full accounts – unless you are a premium/education customer – so standard customers are better using blogger/picasa on a standard google account. If only Google would tidy up their standard GMail interface http://bit.ly/bVxcrl it wouldn’t be so painful leaving my apps account behind! Once the data merge is complete, I’d love to see Google focus a bit on Google Profiles. Specifically, I’d like to see them let users associate their profile with a custom domain. Ideally, I’d like for my Google Profile to “live” at http://google.timothypost.com As you know, Facebook currently only let’s people use “sub-folder” custom URLs. By giving folks a choice between sub-folder and sub-domain URLs, Google would leapfrog Facebook. Just to clarify (if it’s not already clear to some), there are fundamental misunderstandings in the comments and in numerous guides across the Web about the ability to “transfer” a Google Voice number/account from a standard Google account to a Google Apps account. The key step in any such guide, proposing that a user create a new Google Voice account as a destination for the “transfer,” is the heart of the flaw. What the user essentially does in that action is create a new Google account, which itself can have any email address in the world associated with it as the primary login – INCLUDING a Google Apps email address. This does not mean, though, that the new Google account and pertaining Google Voice account magically transform into anything related to Google Apps – only that the login to the standard NON-APPS Google account happens to match the Google Apps email address. All that such guides illustrate is the long-standing process of transferring one Google Voice NON-APPS account to another Google Voice NON-APPS account. Thus, Google’s caution that the transfer process does not work into Google Apps is absolutely correct.